Martha took off to Ireland to spend a few days, including St. Patrick's Day, and that first day by myself might have felt a little flat if I hadn't two very special treats to look forward to: one in the afternoon and one in the evening. As Martha headed out to St. Pancras to catch her train to Stansted, I headed in the opposite direction to catch the tube to Earl's Court Station. 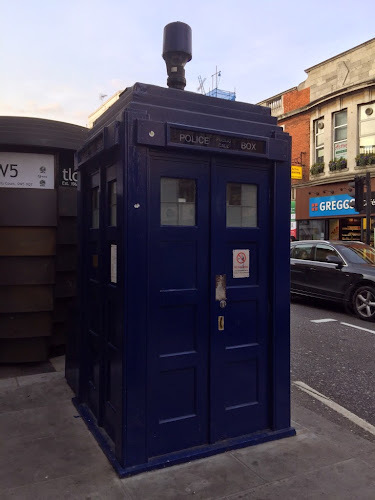 My younger daughter Adrienne had found a Tardis in London and, though I do not watch Dr. Who myself, I am sufficiently informed to know that this would be a big deal to share with my family. I came up with the idea of doing a Google Hangout from the Tardis, so that Adrienne and her son Donovan in Las Vegas, along with my older daughter Danielle and her daughter Peri in New Orleans, could share the experience with me and each other in a live stream. Though we all had plenty of experience with FaceTime and Skype, Google Hangouts was the only way I was aware of that would let us do a group video call. We each had to download the program, none of us had used it before, and it wasn't a completely flawless beginning. But once we had it working properly, it was a huge success. Everyone got to see every side of the Tardis, and I even held my phone up to look into a clear glass pane, hoping there would be something special inside. There wasn't, but it didn't take away from the fact that we had done this together. I've said before, but I think it bears repeating: aside from medical advancements, I think technology's greatest gift has been the way families and friends can interact from faraway locations. The difference between video calls and simple voice calls is enormous in this regard. 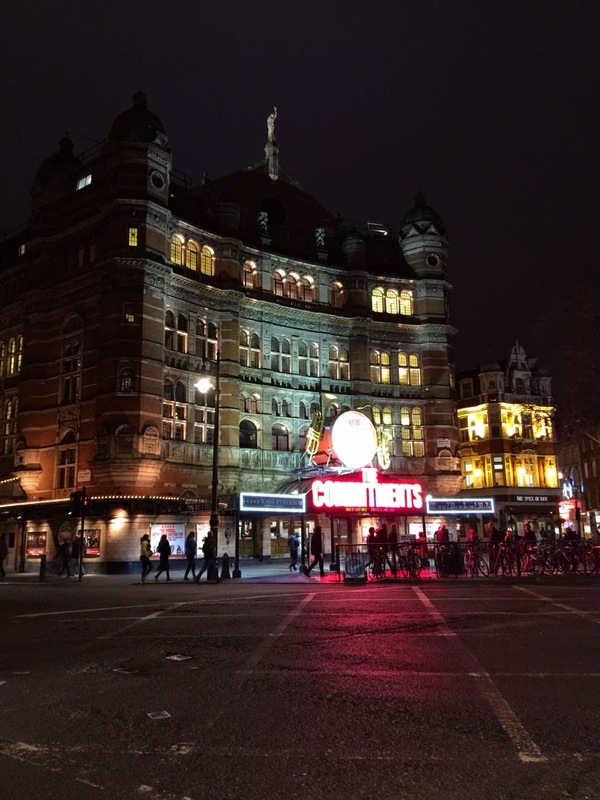 For this special landmark, it was like all of us were there together. It was definitely close enough. From there, I headed out to grab something to eat before my upcoming concert. 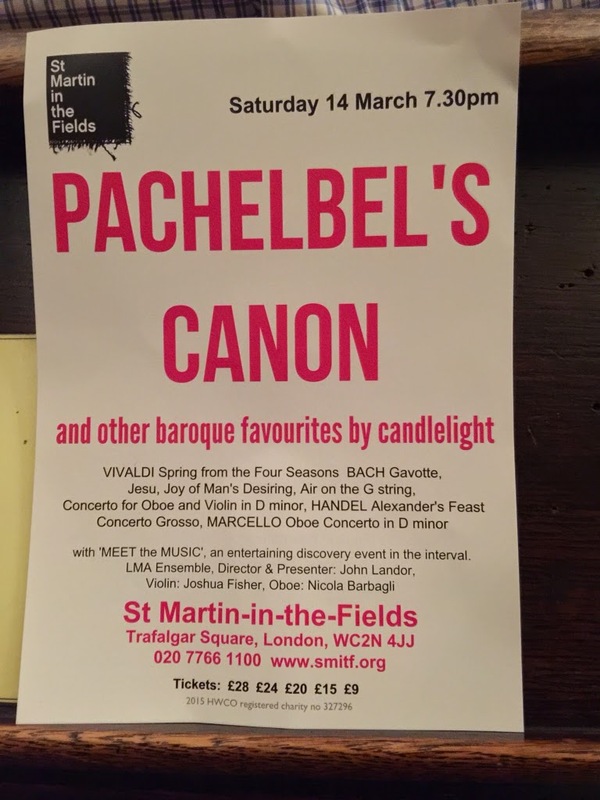 Pachelbel's Canon in St. Martin in the Fields church by candelight. It was every bit as lovely as I was expeciting. Even more so, actually. The sweet young woman who sold me the ticket had pointed out a single ticket on the aisle of row L, at only the second most expensive price, and it was certainly worth every penny of the $32.80. The venue was cozy, intimate and lovely. Unfortunately, no photos were allowed, so I cant share that with you. The musicians were excellent. Not a wrong note to be heard. 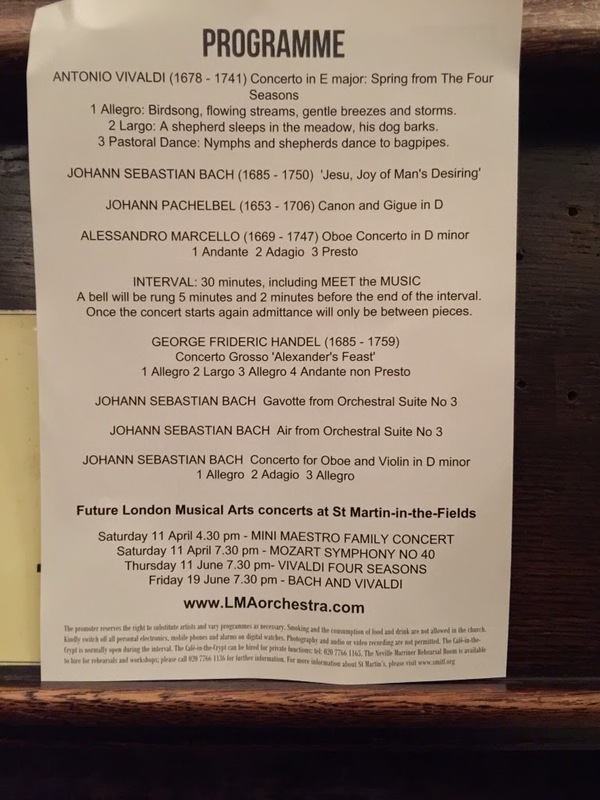 And I loved the pieces they had selected to play. Unfortunately, I was so exhausted that I kept nodding out and I'm sure the people behind me must have noticed my head jerking up. I really regretted having to leave early, because I thoroughly enjoyed the first half and I'm sure I would have enjoyed the second half every bit as much. I went outside during intermission, hoping the cold air would wake me up, but though it was a really hard decision to make, I ended up going home. Gah! 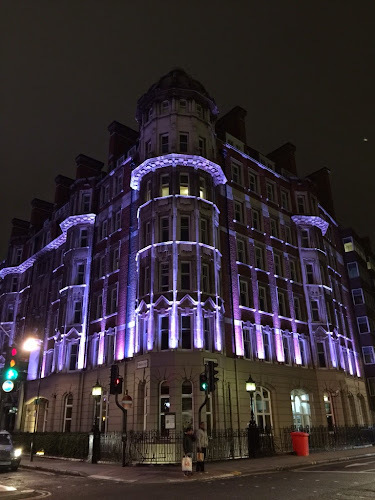 Although I had taken the tube over there, I decided to walk back to the hostel. For some reason, probably because there is so much great stuff to look at, we will always walk a mile and a half without thinking twice about it. Especially after getting into the habit of walking more than 5 miles a day. And the day after Martha left, I set a freaking record for miles walked. But that's the next post. 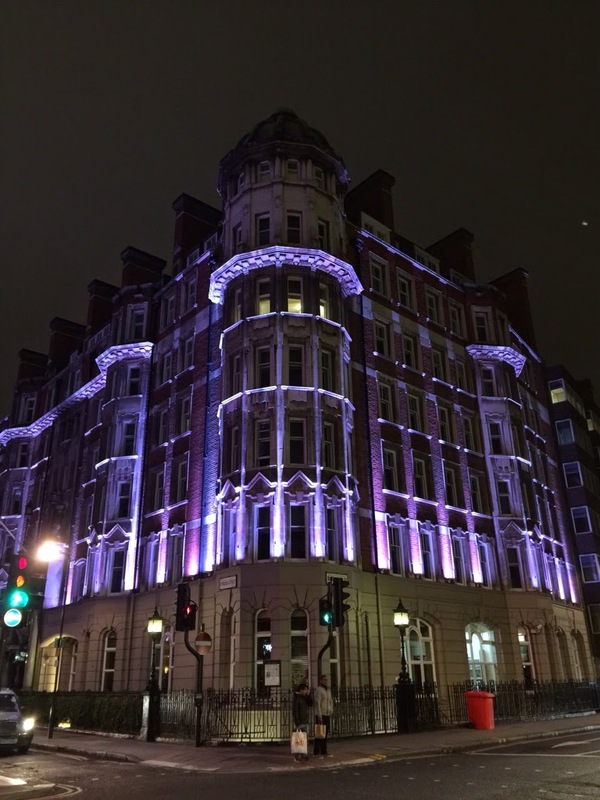 Here are a couple of buildings I passed Saturday night when walking home, nicely lit up, although these photos don't do them justice. I am seriously hooked on the architecture here, and I know it will be the same for every location in this entire trip. Fair warning, lots and lots and lots of photos of buildings to come.